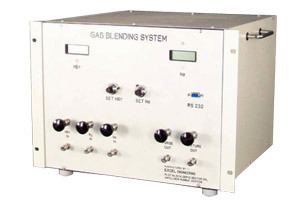 The Gas blending system can mix and blend two or more gases with each other at a predefined ratio. It can be used for blending or to dilute gases to generate precise calibration gas standards, production gas mixtures or to create gaseous atmosphere. The gases can be mixed in a ratio of 1:1 upto 1: 1000. The system automatically dilutes high concentration certified gas cylinder to a wide range of concentrations from high percentage to low parts per million. The system is operated by controls set at front panel. After entering required concentration, the system automatically mixes gases connected to the ports to generate required mixture. The gas mixer precisely dilutes and blends high concentration certified gas cylinders to generate precise gas calibration standards, create gaseous atmospheres, or produce gas mixes for analytical research and process gas mixture purpose. The mixer can produce complex mixes containing upto Seven individual gases in a balance gas. The mixer produces gases from a percentage level to parts per million level for single or multipoint calibration. The mixer consists of control instrumentation and mixing zone. Commands are entered from front panel. Optional RS232 control with computer controlled command mode is also available. Reduced cost of Gas Standards Calibration gases is a costly affair. The mixer reduces / stops costly expense of calibration gases needed for calibration of instruments. Also reduced inventory of gas cylinders due to broad range of dilution ratios. It enhances profitability in process industries due to eliminating costly process gas mixtures. The mixer can be used for online gas mixing. Wide Dilution Ratio: Broad range of dilution ratios (1:1 upto 10000:1) allows user to significantly reduce the number of gas cylinders needed to perform compliance tests. State of the Art Software: Automatic calculation of dilution and span gas flows based on the concentration commanded by the user eliminates the need for manual computation allows rapid transition from point to point and scale to scale. The mass flow controllers are calibrated to using a NIST traceable standard.